To kick off the World of Light mode in Super Smash Bros. Ultimate, we see the game’s characters vaporized by mysterious beams. Almost everyone is taken down – except Kirby. Kirby manages to escape, and that’s where the adventure mode really begins. 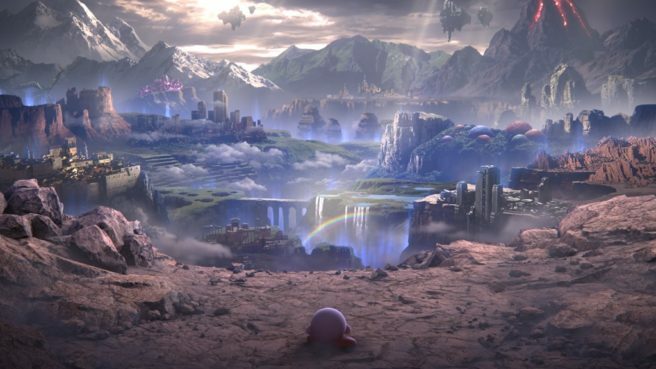 In a Famitsu column this week, director Masahiro Sakurai addressed Kirby’s initial survival in World of Light. He commented on a few other topics related to the game as well. Regarding Kirby, Sakurai admitted that he’s a bit biased as he created the IP and fans’ suspicious on that front are correct. However, from a planning perspective and through the process of elimination, he said it’s obvious that Kirby would be the only one left. Also mentioned is that it was necessary to have whoever would survive the attack have a reasonable method of escape that could actually be shown on-screen. The characters trying to run would be chased to the stars and still get swallowed up, so physical speed wasn’t enough. Teleporting slightly away wouldn’t be enough either. While some may have forgotten, ever since the first game, Kirby’s Warp Star has been able to warp. Some fans noticed that the Japanese name for “Lifelight” when read backwards is “Hoshi no Kaabi” which is similar to “Hoshi no Kirby” (the Japanese series name for Kirby). However, Sakurai said this is merely coincidental. It wasn’t that he wanted to write a story about Kirby. Rather, he simply just happened to be the first character you can play as. Bayonetta and Palutena were among the characters who weren’t able to escape. According to Sakurai, Bayonetta couldn’t escape into Purgatorio as her enemies there had also become Spirits. Additionally, Palutena couldn’t manifest any of her abilities as Hades and the other deities from Kid Icarus had become Spirits. Bayonetta and Palutena would also be kind of difficult as first characters; the first character had to be fundamentally easy enough for anybody to play as. A newcomer to the scene – Erina Koga – sings the main theme in Japanese. Sakurai noted at the time she was just 17. He decided on Koga at the recommendation of composer Hideki Sakamoto. Later in the column, Sakurai confirmed that there will be an update at launch – the downloadable version will be fine as it is. Something is mentioned here about protecting against replay de-syncing. Speaking of which, players will be able to permanently keep replays if they’re converted into a movie format. Sakurai advises to keep an eye on the file size though. Finally, when starting up Spirits for the first time, you’ll receive one Advanced-class sticker. Sakurai said that seeing what you get can be a little bit of fun.